We are heading to the beach later this week, so I thought it would be fun to do some movement activities that involved ocean animals. This was a big hit and I think we'll be doing it again this afternoon when my son wakes up from his nap! Materials Needed: ocean animal action cards pdf file (download them here), colored cardstock, and painters tape. Optional: soccer ball and contact paper to use to laminate cards. * I chose ocean animal names that started with a variety of letters and had actions that were easy and do-able. 1. Print out the ocean animal action cards on colored cardstock. You can also color them if you'd like (or have your child color them), we opted not to color today. 2. Tape the cards on the floor. Try to spread them around the room so that you have space between each card for movement. This would work in a open room/space or on a patio. 3. Start the movement activities!! There are several variations you can try depending on the level of your child. - Start by walking around (or running) to each card with your child. When you get to a card, point to the picture, say the name of the ocean animal, read the action statement, and then demonstrate how your child can do the action stated. Have them copy you and then move to the next card. - Once I had introduced all the cards, I would say the name of an ocean animal and my son and I would try and find it, stand by (or on) the card, and do the action quickly... and then we'd move on to the next animal I would say. - After he learned all the ocean animal names and actions, I would say, "Find the animal that... and I'd state an action (ex. sings under the water)" and he'd run over and stand on the humpback whale card and sing. We did this until he got bored. - We also incorporated his soccer ball into the activity and I would say, "dribble your ball over and find the... (ex. fish)." He would kick the ball over and try and trap it on top of the correct card. - When he was bored of dribbling the ball, I had him pick up the ball and bounce it on the card that I talked about. For example, "Bounce the ball on the card that tells you to dig"... or an easier one, "Bounce the card on the humpback whale." He would bounce the ball once on the correct card and we'd move on. He loved this and it helped him practice aiming the ball. - Next we worked on letter recognition and I would say, "Find the animal that starts with the letter..." (ex. O... and he'd go find octopus). This activity was a lot harder for him since he is still at the very basic level of learning his alphabet letters. He needed some prompting to focus on the letters at the beginning of the words. For older kids this would be a great activity as you talk about initial sounds of words. You could have the kids tell you the letter at the beginning of the word and the sound that it makes. - For older kids who can already read or who are learning to read, you can have them try and find the action words in the sentences. For example, "Find the card that tells you to... jump." They can go to the dolphin card, read the name of the ocean animal, do the action, and attempt to read the sentence about the animal. - We also talked about colors during this activity. I tried to put each animal on a different colored piece of cardstock... so sometimes I would say, "Go find the... orange jellyfish." This was a very simple activity and would be perfect for younger kids who are learning their colors. Not only does it reinforce learning colors, but also teaches them some new vocabulary words. The main reason this activity was so fun was because it provided for a lot of variation, which kept it interesting. It also worked on a broad range of skills- from color recognition to listening comprehension to letter and word identification, etc. If you want to do some ocean crafts along with these movement activities, I love this book by Sally and Stewart Walton. It has some great ideas. We will probably be trying some of these out later this week! Great idea! I love how you are always combining so many different learning opportunities into an action based activity. I love this! Could you email me a copy to ssbaugh@yahoo.com? Thanks! What a cute new way to get the kids moving! Would love to get a copy email- tramcdermott at yahoo dot com. Thanks! I too would love a copy! Please email to rlschoen@shaw.ca. Thanks! That singing like a humpback whale picture is awesome! :) I love this idea. Sorry, I just noticed the email part. I would love a copy. Thanks for the great idea! Planning ahead for my ocean theme - and - these are too cool! I would love a copy. Unfortunately I don't see an email address. Pass one along and I would love to send you the pdf. hi there! recently found your site and you've got great ideas! thanks for sharing. could you please email me the pdf for the ocean animal cards? my email is sbw124240@cox.net. These are fabulous. Thank yoU! We are about to begin an ocean unit and I would love a copy of these! Thanks so much! I love this activity. Would you please send me a copy of the pdf file? 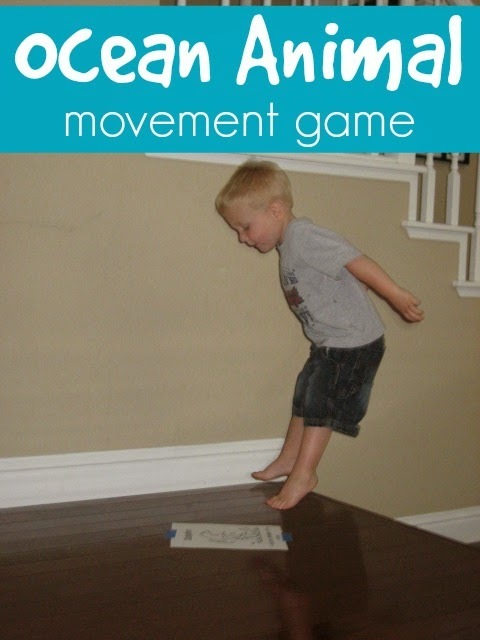 LOVE this idea for gross motor! Could you please send me the files to print, jakobsfarm5@cin.net. Thank you! I would love the file too email mom1_elbuac@yahoo.com Thank you! Love this! I work with 24 two year olds and they would love it too! Can I please have a copy? kbashucky1515@gmail.com thanks a bunch! Thanks for the cute movement cards. I printed them off to use with my group. thanks - such a great idea !! I would love a copy too, Please. pleadr please email me a copy. I'm so tickled to find your Ocean Week! We will be playing with our grandguys while Mommy and Daddy take a cruise. So we will be learning about boats and fish and seashells. This Ocean Movement game will be fun to outside with squirt guns, wading pool and sand box...as long as it doesn't rain!! I teach a preschool class, and this would be a fun activity for them when we do our "Beach Day in February". Could you please email me the pics? Thanks so much!